New SD Elements release: Content shipped with a new release of SD Elements may add tasks based on emerging threats or new research. Tasks may also be marked for removal if they are consolidated into other tasks. Customization: Administrators may choose to add or remove content at any time from the content library. These changes are not propagated to projects unless they are accepted by user action (users click "Accept Changes") or through an automated mechanism (an organization-specific process using the SD Elements API). Each time a project is opened, the system checks if new content updates may apply to it. Basic updates to the content itself, such as changes to text or new How-To’s, are applied seamlessly without action. However, if there are new tasks or tasks that should be removed because of modified rules, then you will see the New Content Updates Available button beside filter and search. 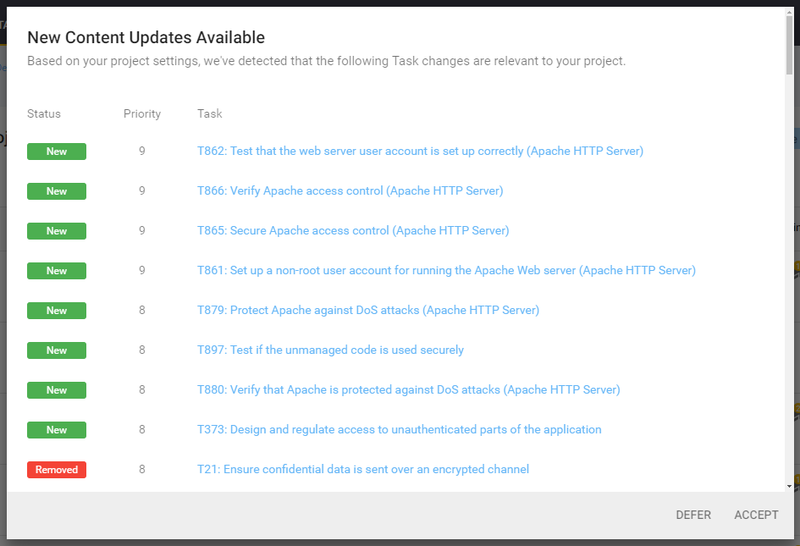 Accept: Updates are applied and the task list reflects the suggested changes. Defer: New content changes will not be reflected in the list of tasks. Click on "Defer" if you wish to keep the list of tasks static. Deferring content updates may leave a project at risk of not tracking against the latest security vulnerabilities or business risks. Review the suggested list of content changes by following the steps below. The user has the permission Project Roles→Project Management→Edit project survey. Open the project’s task list page. Click the New Content Updates Available button when it appears. The list of task additions and removals are listed. Click on a task to examine their details. Review the suggested list of content changes following the steps below. The user has permission Project Roles→Project Management→Edit project survey. Click Accept to accept the changes. Click Defer otherwise. The project task list is immediately updated with the suggested task changes.